Mumbai: Established with a vision to bring about innovation in higher education and learning in emerging areas of the knowledge society, the not-for-profit NIIT University (NU) hosted its 7th Convocation Ceremony at the Neemrana campus. Dr Raghunath Anant Mashelkar, an eminent Indian scientist and former Director General, Council of Scientific and Industrial Research (CSIR) was the Chief Guest on the occasion. Dr Mashelkar is also one of the Founding Professors of NIIT University. Mr. Rajendra S Pawar, Founder, NU and Chairman, NIIT Ltd.; Mr. Vijay Thadani, Co-founder, NU and Vice Chairman and MD, NIIT Ltd. and Prof. VS Rao, President, NIIT University were also present on the occasion. At the 7th convocation ceremony, more than 300 students were awarded degree certificates for successful completion of various programmes at NU. While 213 students received B. Tech degree, M. Tech was awarded to 13 students. 62 students received MBA (Finance & Banking) and 45 students received degree in PG Diploma (Banking & Relationship Management). University also granted its first PhD in Educational Technology. NU will also be offering courses for students having Science and Commerce background, including- BBA (Marketing & Marketing Analytics, Family Business & Entrepreneurship, Finance, Banking & Fintech, Business Analytics, Communication & Media Studies and Digital & Social Media Marketing) and 4-year Integrated BBA – MBA programme. On the graduation, all male graduating students of the university were wearing bright maroon jacket on a silk kurta pyjama, while graduating women wore a maroon Sari. When asked this question on why we don’t use common graduation gown and a graduation hat. Dr. Sunil Khanna, Dean (Research) opined that choosing traditional wear in the place of the colonial culture of graduation gown and hats was a symbolic gesture of leaving the old behind and moving on. It is also in keeping with the values of TALF – The Asian Lenses Forum initiative by NU, wherein we are now looking at the world through a different lens of Asian heritage and culture. The university campus was brightly decorated by student and staff for the Convocation Ceremony. Graduating students also left messages for junior students on the ‘Memory Wall’ created for this occasion. Graduating students, their parents and other eminent guests from the field of education were also present on the occasion. Over the years, NU has been building extensive linkages with the industry – it has active collaboration with leading organizations like: Microsoft Research, IBM, WNS and PwC. 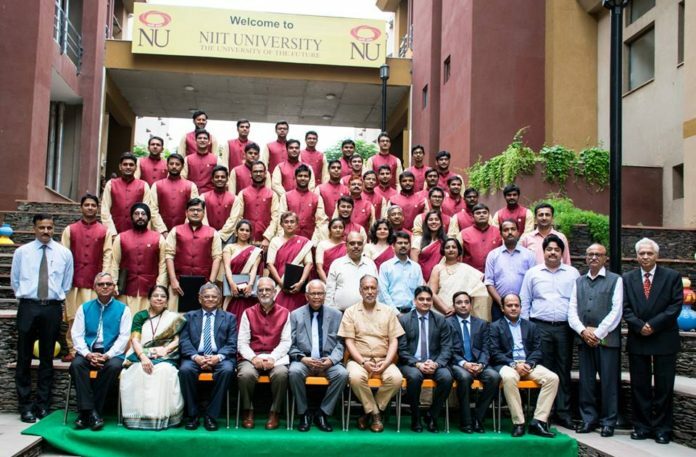 NU now brings futuristic programs from NIIT to design a B. Tech CSE program that is aligned to what the IT industry today needs. With a legacy of training over 35 million people in IT and other career focused programs since 1981, NIIT is now working towards creating a trained talent pool for the digital economy.